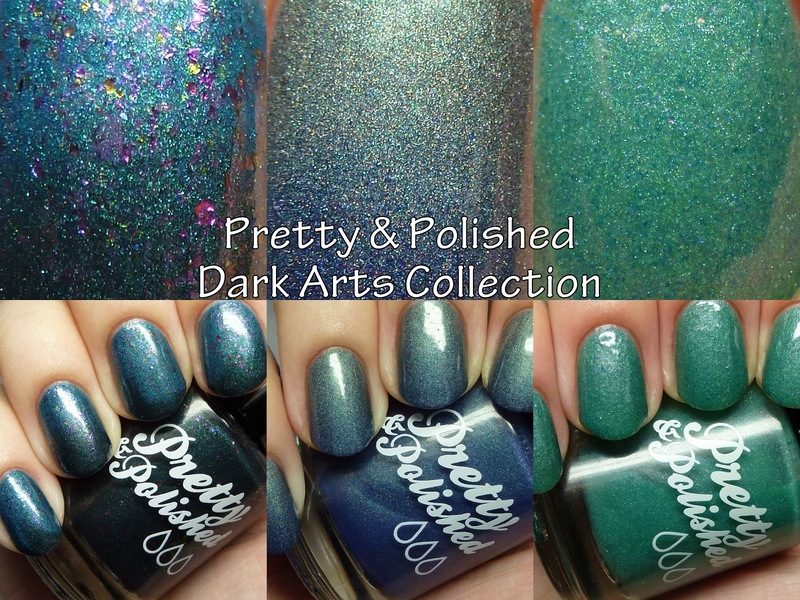 Today I have the second half of the Pretty & Polished Dark Arts Collection up and its a doozy! 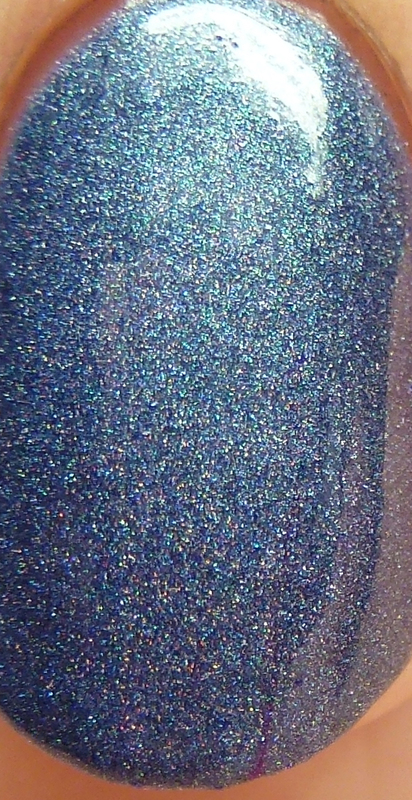 (first half here) These polishes have all the bells and whistles; holo, thermal, glow in the dark, matte, texture, flakies, it's there. I went hog-wild on the photos so check out my extravagance after the break! 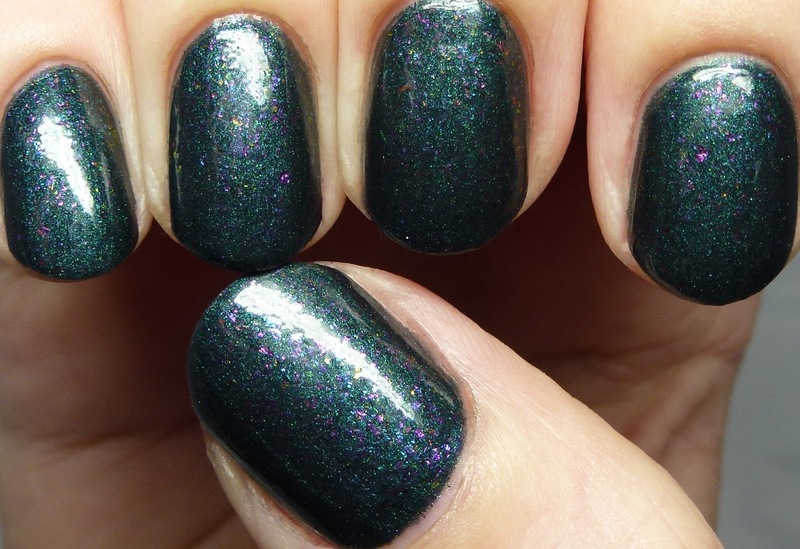 Necromancing The Stone is a thermal that goes from a deep midnight green to a lighter blue when warm. 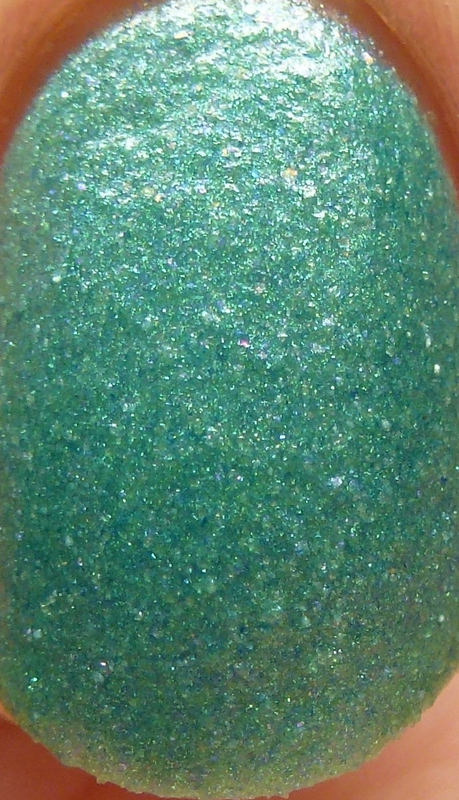 It has a mix of multichrome flakes and dries to a matte, textured finish. 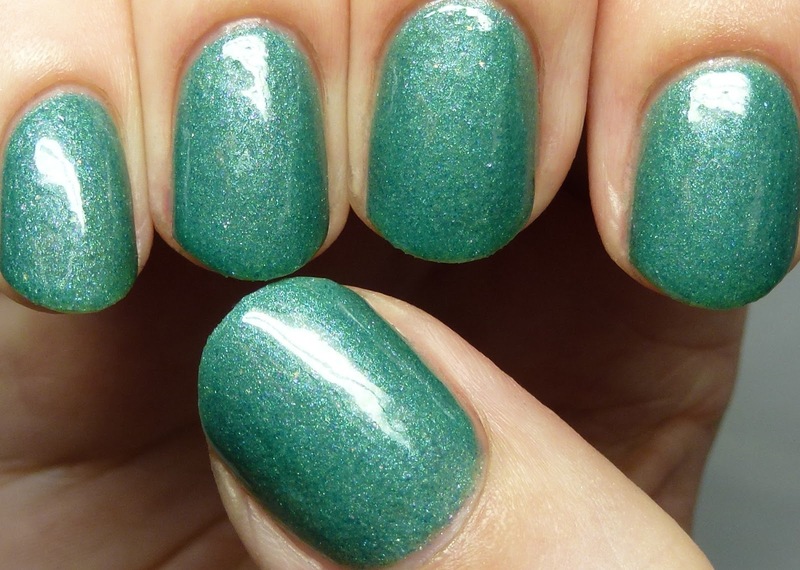 I wore it with four thin coats and it was perfectly opaque and quick-drying. Bear with me as I show you all its facets! First, here it is in its natural matte, textured state, in the warm color. Next, I top coated-it and it settled in in the cool shade most of the time during the day I wore it. Here it is again top coated in the warm state. Finally I have showing the warm state and cool state simultaneously, using a hair dryer and ice. If you have short nails like me, it probably won't look this way but I wanted to show what it might be like on longer nails. The shift is quite strong and abrupt. 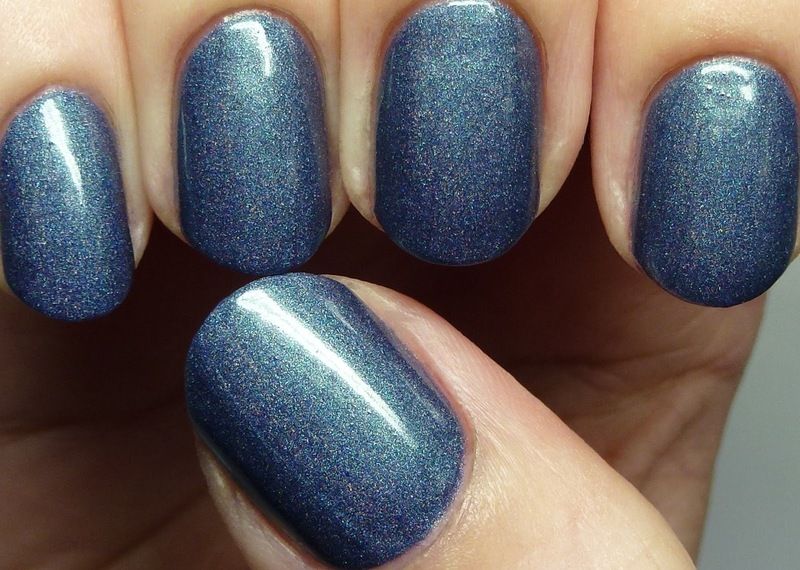 Suspended In Dusk is both a lovely name and a lovely polish! 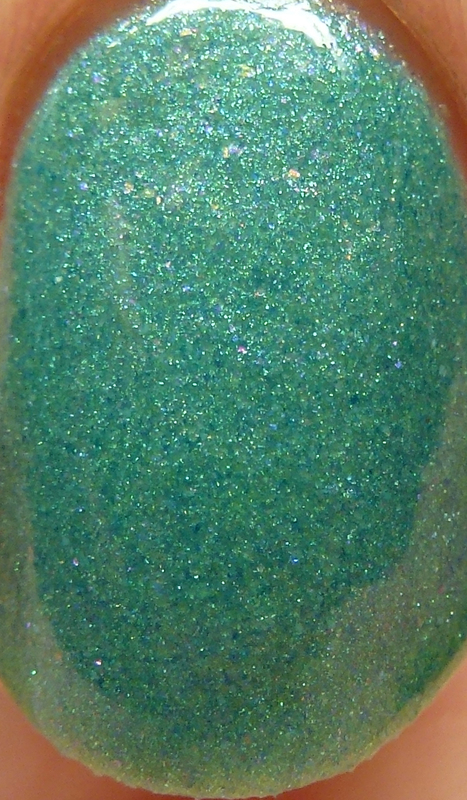 This has a subtle scattered holo in a catalina blue base with lighter blue-green highlights when cool, and the lighter shade takes over completely when warm. It dries matte and ever-so-slightly textured. Great, quick-drying, self-leveling formula. Here it is in the warm state without top coat. 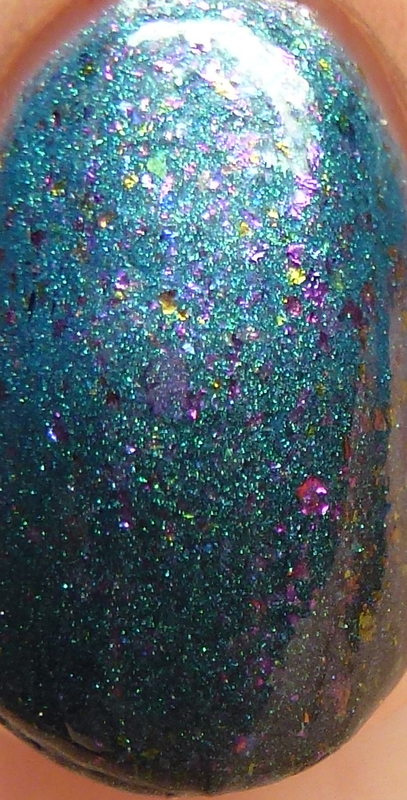 This is with top coat in the cool state. 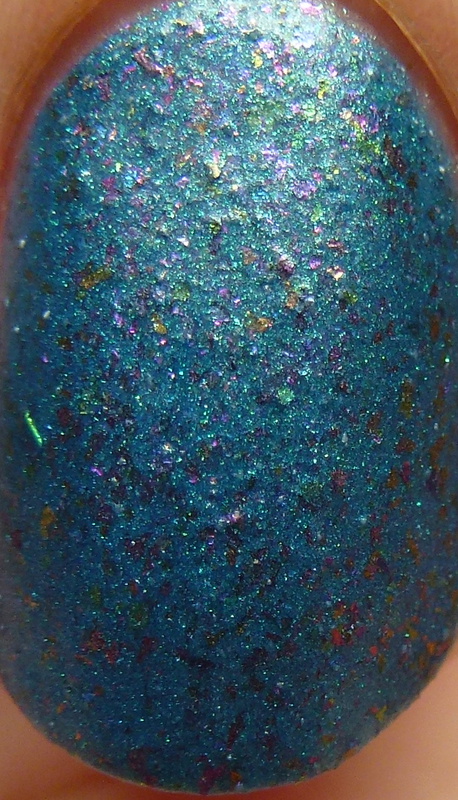 Here it is again in the warm state, but with top coat this time. This is the combo shot with both colors. The shift on this one is strong but it is more gradient-like. Again, it will probably only look this way on you if you have longer nails. 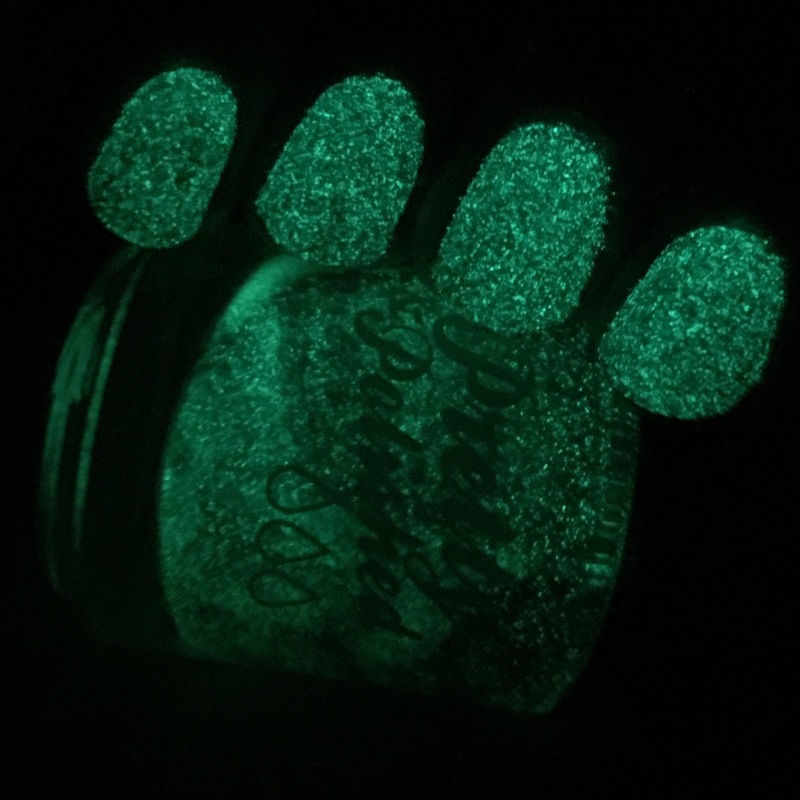 Finally I have They Call It Witchcraft, which is not only thermal but a super-strong glow in the dark. 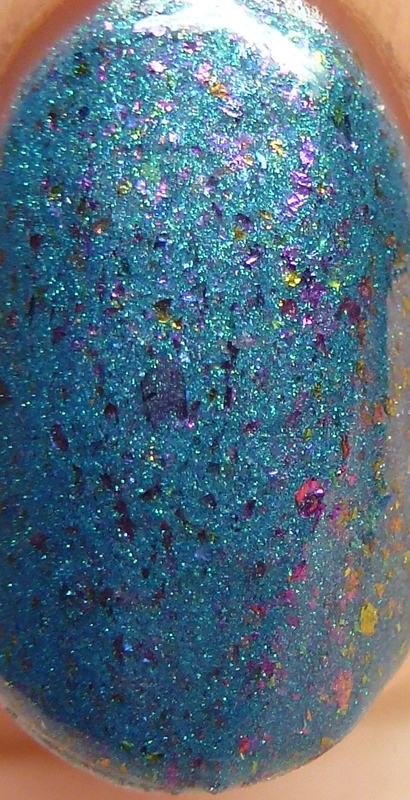 It has pink and green microflakes and dries matte and textured. The thermal on this is very subtle and I could not catch it well - it is a bit lighter and cooler in the warm state. This is four thin coats. First, in it's matte, textured version. 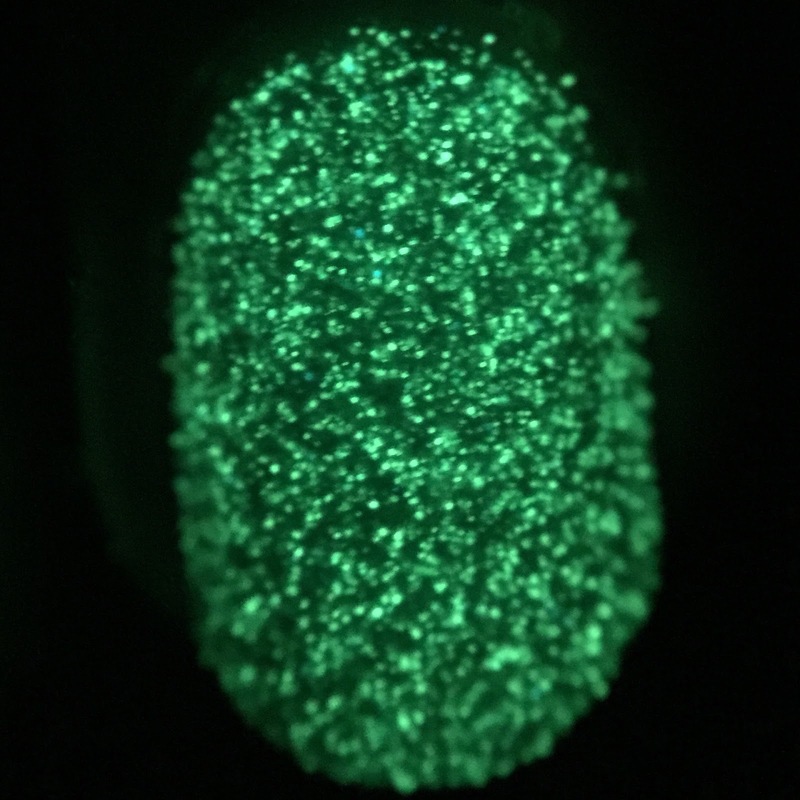 Look how strong the glow on this one is! You can see the logo on the bottle clearly. 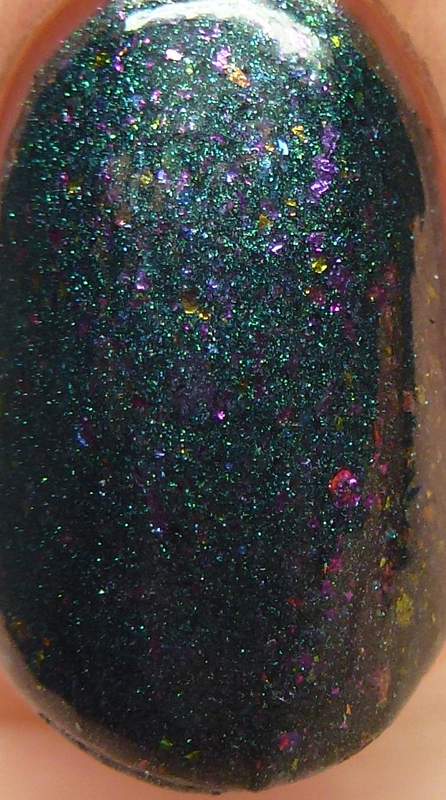 Here you have it with topcoat. Finally, this is my attempt at catching the thermal shift. You can see the tips are a tiny bit greener. This collection is available now and the three you see here are priced at $9 each for 15ml. You can also buy the full collection for $50. Be sure to check out my post of the first half of the collection as well! Have any of you tried a thermal before?